It was Year 8 open day at Tamaki College today, with all the Year 8 students in the surrounding intermediate schools coming for a college experience day. As the person in charge of TCTV, the school blog site, I decided to try a first on the day, and shoot, edit, upload to YouTube and put onto the blog all from one of the school iPads throughout the day in a series of instalments. Previous to this, we have done all the editing etc on macs after the events, not during. 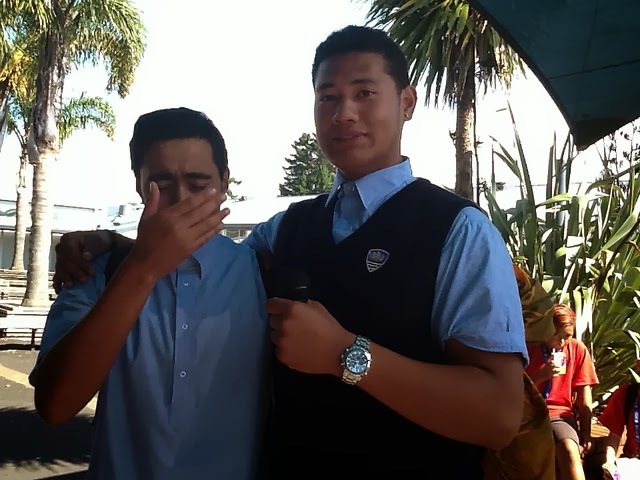 The boys doing the presenting were up for the challenge so we gave it a go. The iPad already had what we needed installed, Safari and iMovie for iPad. It all went smoothly. It was easy to shoot the video, with the sound coming through surprisingly well. Editing was ok on iMovie, although we could have done with some headphones or ear buds as there was always a lot of noise around while trying to do the editing. Transferring from iMovie straight up to the school YouTube account was generally smooth with one wrinkle when it decided to not play the game. At this point we ignored it, went and shot some more video and came back to it when it had stopped sulking. The one fly in the ointment today was the inability to get the embed code for the uploaded videos from YouTube on the iPad. When we hit the share button, the embed option was there but it would not work. So, we had to cheat a little on our original plan and take a chrome book around with us too so we could do that final stage of putting the video from YouTube onto the blog. Visit TCTV here, if you want to see our efforts today. I have set up Google Plus Communities for all of my groups this year in a bid to address where I see the main weakness of the DVC course. We always seem to have trouble with the notes and analysis, both of the work of others and the work produced in the lesson. This week, Level 1 and Level 2 groups have been using the communities quite a lot more. ( in this case, we use Adobe Illustrator ). I set up a google drawing with some set elements on it for them to manipulate. 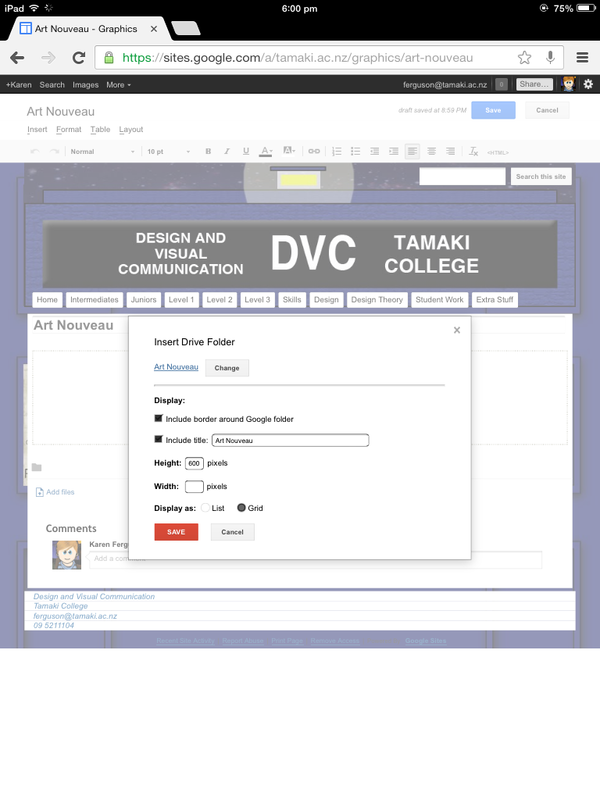 Make a copy of the Google drawing shown here. 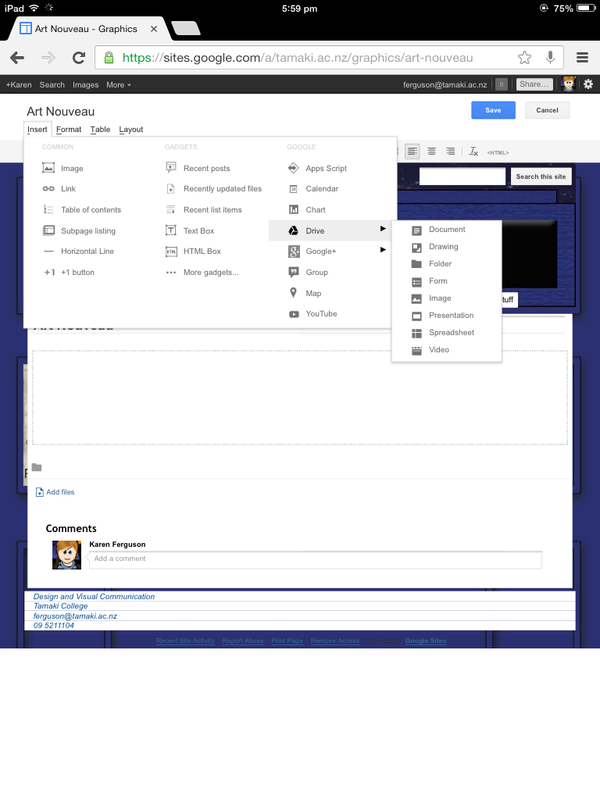 Link your layout onto the Google Plus community for everyone to see and critique. The students had about 20 minutes to get a copy of the drawing, work on their first layout idea and get the Google drawing linked in the Level 1 Google Plus community. We then had a chat about the comments that they were going to make on each others work. Making a positive comment was easy, except just saying that part of the layout was "nice" was frowned upon and changed to reasons why they liked something. We chose to call the second comment "helpful critique". With this one, they had to say how part of the layout could be improved, but in a supportive way. As usual, no one really wanted to be first to start the comments, so I went first. I will only do that for this first time though. They need to fly solo. I was pleased overall with the comments that were coming in about each others' work. They seemed to be looking at the work and using the things we had been discussing. Check out the community on the link here, and see what they have been saying. The task for the level 2 group was to collect images that related to the Art Deco elements in the given grid. I chose to get them to do this on PicMonkey, as they are all familiar with this and could concentrate on the content. They need to understand what makes Art Deco what it is in terms of the main elements that are key to the design era. Being able to see each others collages as they were posted helped with their understanding, as other people use different images to illustrate the same word. Part of what they have to do in order to gain a higher level of understanding in this project, is to compare Art Deco to another design era. Link to the achievement standard here. I have posted up a Google slide show with 2 images of similar objects, and they have to choose which one is Art Deco from the two. On each slide, indicate which one you think is the Art Deco design out of the two. They made a start on this today, so when they create their Compare and Contrast diagram between Art Deco and Art Nouveau, they will have a deeper understanding of what characteristics are key to Art Deco. Check out the community on the link here, and see what they have been posting. The students acceptance of posting in this way and for everyone to see it. It doesn't take too long, so it doesn't have to be the "only" thing that happens in a lesson. The ability for the students to learn from what the rest of the class post. The students can look at what is here and use it to help them when they have to do analysis in their own project work. My Level 2 group is spread across 2 classes, so they can see what the others are doing and vice versa. I have been experimenting recently with putting multiple photographs on a Google site using an iPad. This was originally in response to a question I was trying to help with and then today I was asked to do a blog post about it to help others. These are screen shots of the process I went through. 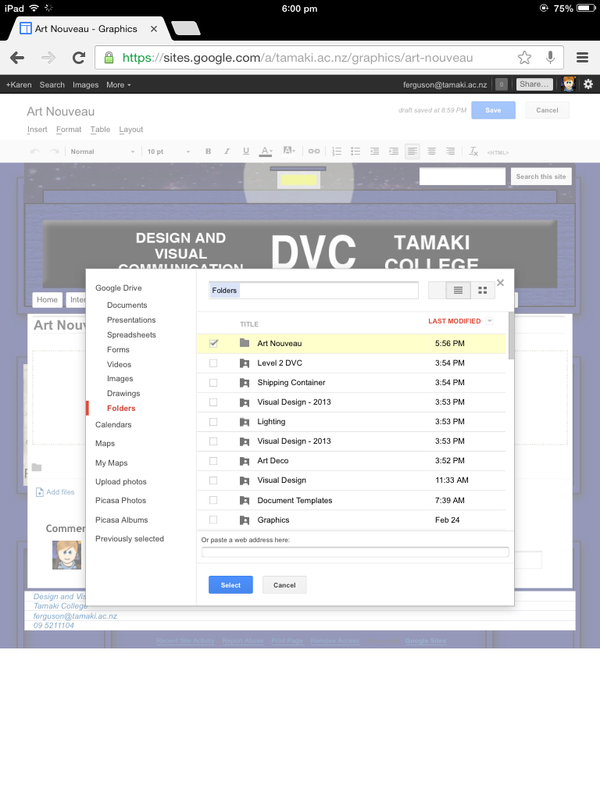 I have used a combination of the Google Drive app and the Chrome app, both of which are free. Make sure that the photos you want to use are on the iPad. 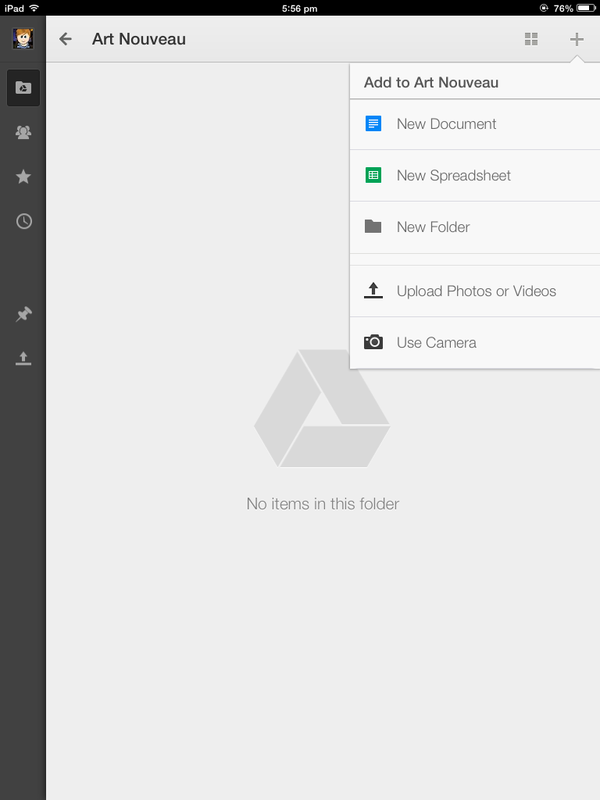 I started by using the Google Drive app for the iPad. 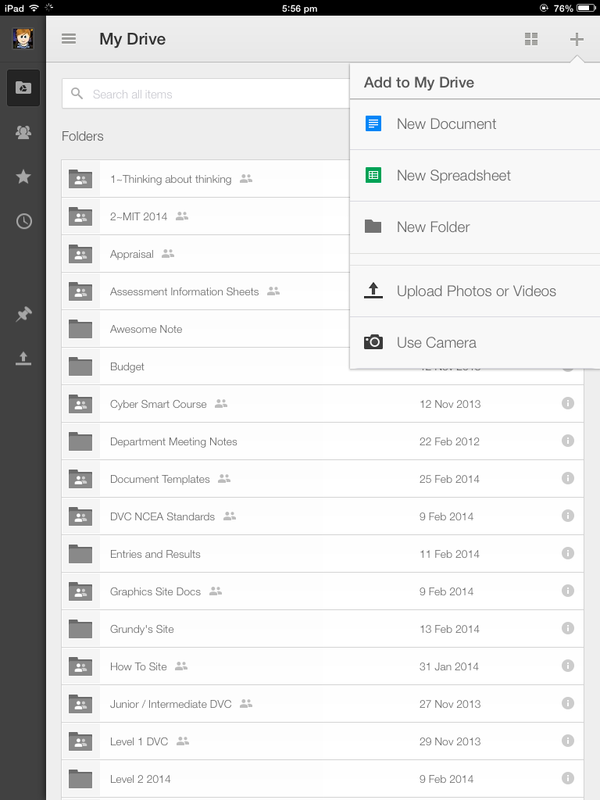 Click on the + symbol on the top right and choose new folder. Then name your new folder. 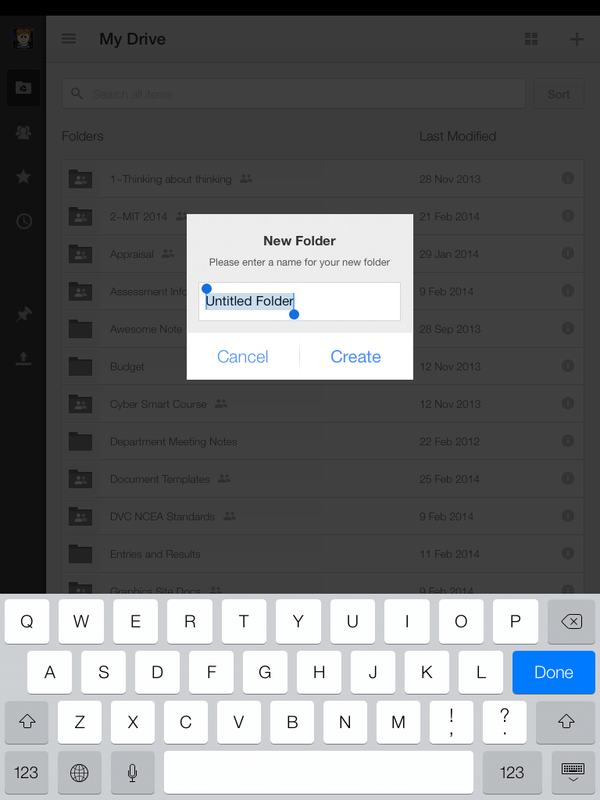 Open your new folder from the drive list and click the + button again. This time choose to upload photos or videos. It will ask to have access to your photos on your iPad. 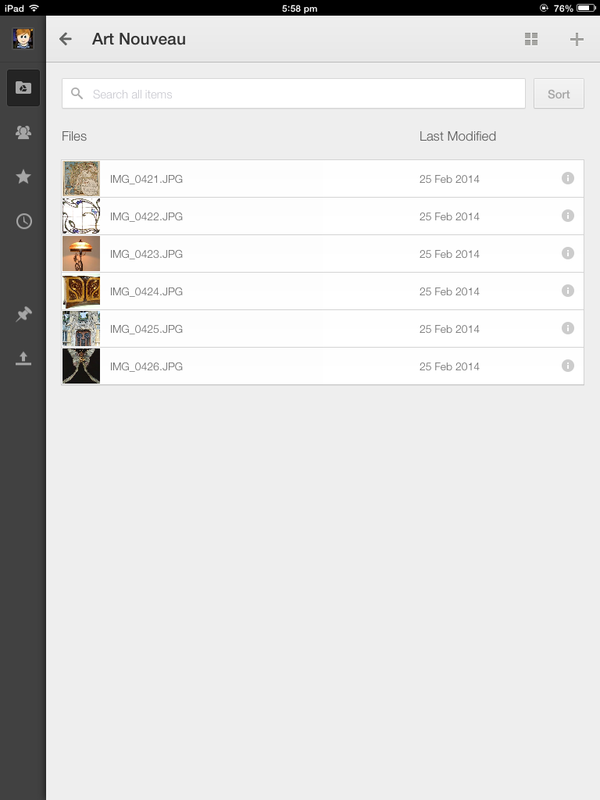 Open the photo album choice and tick the photos you want to upload into the new folder. Your nicely uploaded photo files will now be sitting nicely in their new folder. Next, I used the Chrome app to work on my site. Open the site page that you want to put the photo folder, and click on the pencil to edit the page. On the insert menu, choose drive, then folder. Tick the folder that you have just created and put pictures into. Next, make sure you tick the option for the grid view. This way, you get a preview of your photos when the folder is embedded on the site page. You embedded folder looks like a normal Google gadget when your page is in edit mode. 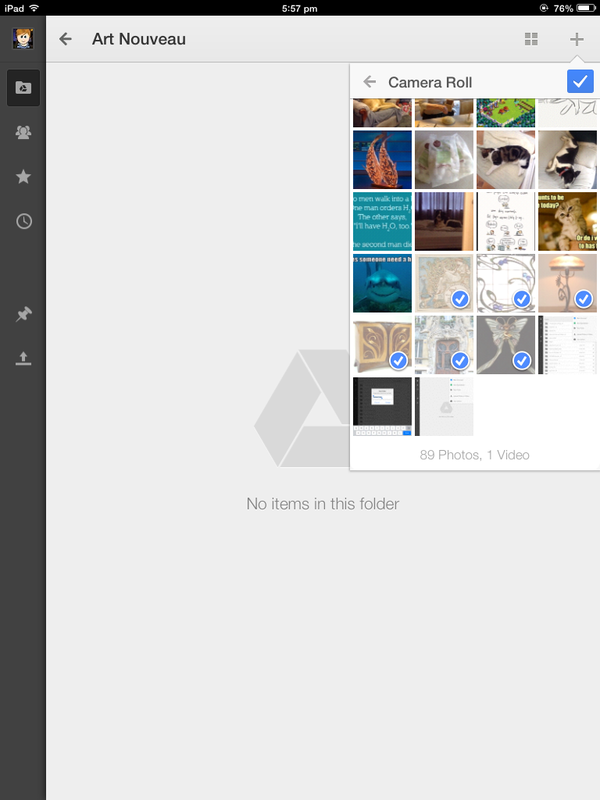 When you save your page, you can see the embedded folder with the photos that you uploaded. These photos are shown in thumbnail mode due to you ticking the grid choice. On my timetable this year, I have my Level 1 group for a double period on Friday mornings. This week we have been using the apple suite in the Tech block to learn how to use Adobe Illustrator, but we can't do that on a Friday morning as it is being used by our lovely intermediate visitors for their Technology rotation. 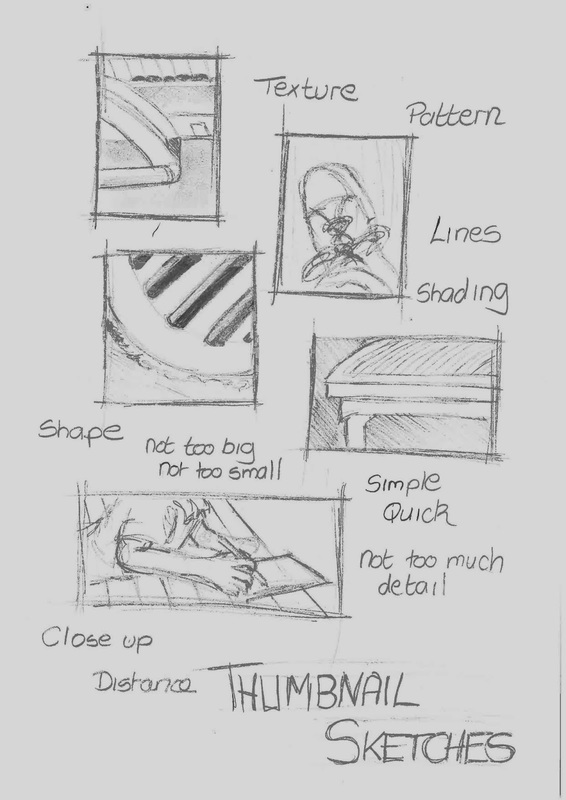 This morning we were going to start looking at thumbnail sketching, how to do them and why you would use them. It is an extremely hot day today so we grabbed the bean bags and went over to the new covered outside area by the Marae. The Level 2 ladies were able to work on their netbooks to continue with their Art Deco work and the Level 1 group started producing their thumbnail sketch practice drawings. They had to look at what was around them where they were sitting. Close up / mid range / far away. The thumbnail boxes were not to be too big and the sketches had to be quick and loose, not too much detail. Check out their sketches here. I have scanned them in and emailed them to myself and uploaded the files to a Google Plus album. I used Flickr in previous years to put the students work photographs on but I am having issues with the embedded album showing on the class Google site. We are using Google plus for communities this year, so going here for their photos too will be fine. Next week they have to grab their own work out of this album and put it onto their own DVC Google site. I had my year 10 class for DVC today and we are onto thinking about where they can get the best information about the technology project they are doing. 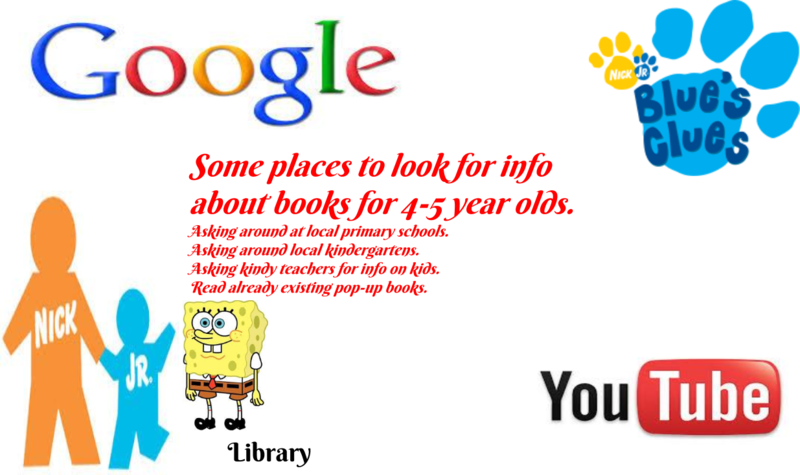 We are designing pop up books for young children and the students need to get information from a variety of sources. My original intention was to do this thinking activity in small groups using an online app called Padlet. After using this at the end of last year and having a few issues with it not showing up on the Google site page after it was embedded, I changed my mind today and went for using Google drawings for the group work. ( all the class have their own Google sites to embed al their work onto for the project, so I didn't want them to have embedding issues ). The class got themselves into groups very smoothly today, without any nagging from me, which was a good start. There is plenty of areas in my room so each group got a space to work in. One person in the group had to start the drawing and share it with the rest of their group and me. If group members have a device with them, work on that, or work on one of the class computers, or sit next to someone and tell them what to type! !...They all got online. To get them started, we had a class discussion / shout out of some ideas. Once they were underway on the drawing, they got into the flow and all started adding ideas. The revision history of the drawing is a great way of making sure that everyone in the group has contributed in some way to the discussion in the session. What we need to do now is analyse what each group member has added. One way of doing this, and adding value to what they have done as it makes sure they read and evaluate what the others have put into the same document as them, is to highlight what they think is the best suggestion on the page and use "insert a comment" command to explain why they have chosen that idea to move foreword with. There is room on the worksheet (link here), for them to add up to 3 information sources that the group chooses to pursue. One of the things that students have to do in the higher levels of SOLO taxonomy is to analyse and choose from a variety of sources of information, and this also takes them into the higher levels of achievement with the Technology assessment scheme. I am hoping that by doing this as a group activity to start with, they will gain experience and confidence for when they have to do this on their own. 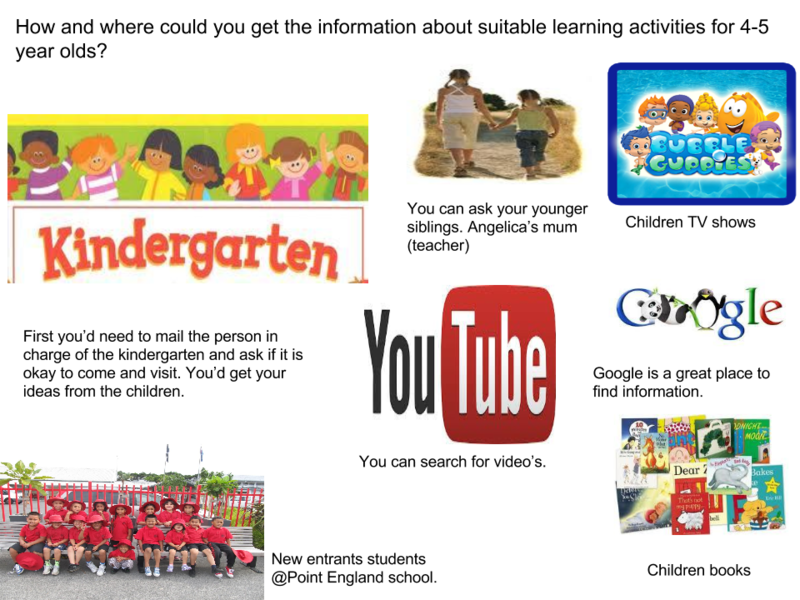 Here is their work, which I have saved out of Google drawings as image files. I had the pleasure today to be part of the MIT 14 team hosted by Telecom. We had out first meeting of the year in their FABULOUS down town headquarters. The area that Lynne from The Telecom Foundation gave us for the day was lovely with lots of different areas for different things over the day. A very modern learning environment!! We started the day with a look at what the research projects are that the group are undertaking this year. With everyone having very different age ranges and are from different schools ( mostly ), the focus of the projects cover a range of areas. The link to everyone's inquiries is here. We had to read the inquiry intention of the person sitting 2 away and think of a "good" question for them to get them talking about their plans. One of the things that came up in the conversation for me was how to track the progress of the Level 3 students that I have in my class who have not done the subject since they were in Year 10. With the Level 1 students, I can look at their Asstle results from the end of last year and for the Level 2 group, I can look at their DVC achievements from last year if they took it. This does not apply to most of my Level 3 group. How can I have a level start to compare them all from and know their abilities? A suggestion from Dorothy was to use their English NCEA results from the previous year as a guide to their reading and writing ability, as their analysis and note writing is what I am hoping to increase in my inquiry this year. ( DVC students are always surprised at the amount of writing and thinking there is in the subject !! ) I like this idea as it can also be used for the Level 2 students ( some of whom are new to the subject too ). So that is going on my to do list for next week, as will talking to their English teachers from last year. I looked at Helen's plan for her work and even though Helen's inquiry is very different to mine, as she is looking into embedding the key competencies within her teaching of her students, what I took away from her today was the use in the classroom of the specific language that you want the students to use. Helen had not been using the language of the key competencies long before her students were using it in conversations with her and each other. My students in Design and Visual Communication always need to use specific design language when they write their analysis notes with their work and the use of this is specifically required in a number of the Achievement Standards. We need to start using this language as part of the everyday things that they hear in the classroom / lesson, then it will not be such of a problem when they have to write using these words. The Google Plus communities that I have set up for each level will also help them to practice using these words to describe design in a no pressure / no assessment situation. So...lots on my to do list after this meeting. And so it starts!!! The Telecom building is GREAT!! It was a busy week for the school Flickr account with photographs going up from both the Year 9 settling in activities and the Powhiri. 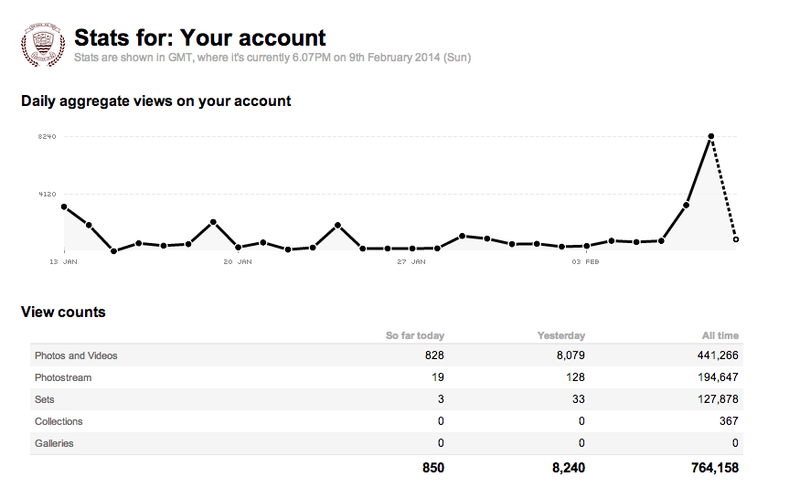 What has amazed me is the number of hits the account has had over the weekend. I feed the photographs through to TCTV, the school blog account and to a variety of social media ( Twitter, Google Plus and Facebook ). I have noticed over the time that we have been using the Flickr account that more people are coming to Flickr directly. The students know that the photographs will be there, and we all know how much they love looking at them selves, so they go there directly after a school event has happened. What has happened over the weekend though, has blown me away! It has been a busy first couple of days back. I had all my seniors make Google sites last year to put all of their work onto. They shared their sites with me, which made my "my sites" page VERY long and difficult to find things in. This year, the students have made all their sites open to the world and have emailed me the url link to their home page. 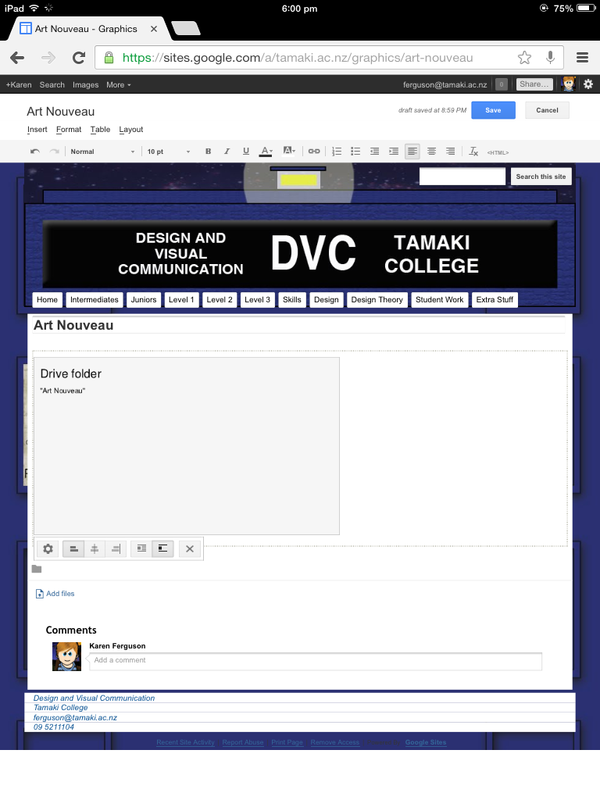 I have made a table with the links to all of their sites on the Student Work tab on the DVC site. I can then navigate to their sites easily from here without it bogging down my sites page. This also makes them accessible to anyone else visiting the site to see what the students are working on. 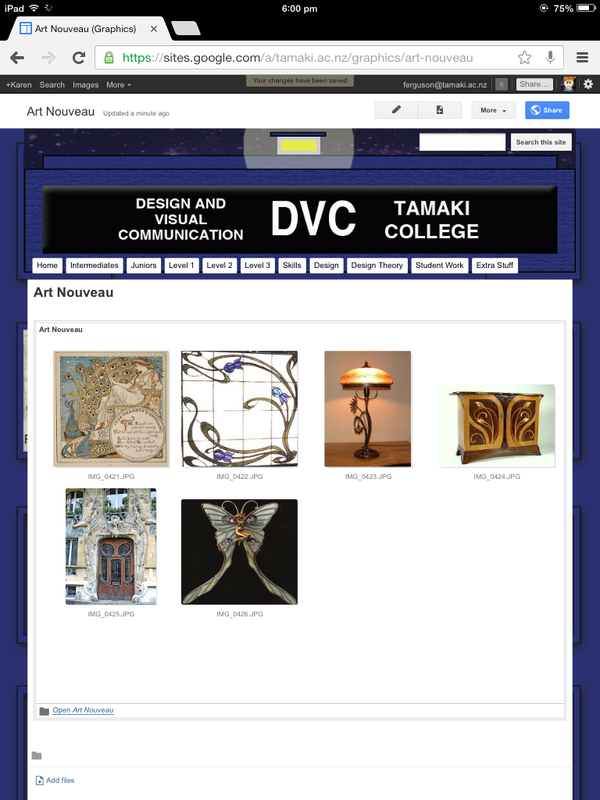 The new to DVC students had to make the site, make all the tabs for the projects and put them on the horizontal navigation bar. They then copied the calendar from the DVC site onto their own Google calendar and embed it onto their homes pages. Those who had a site from last year had to archive their pages into drop downs under a Level 1 or 2 tab and then make the new pages for this year's projects. 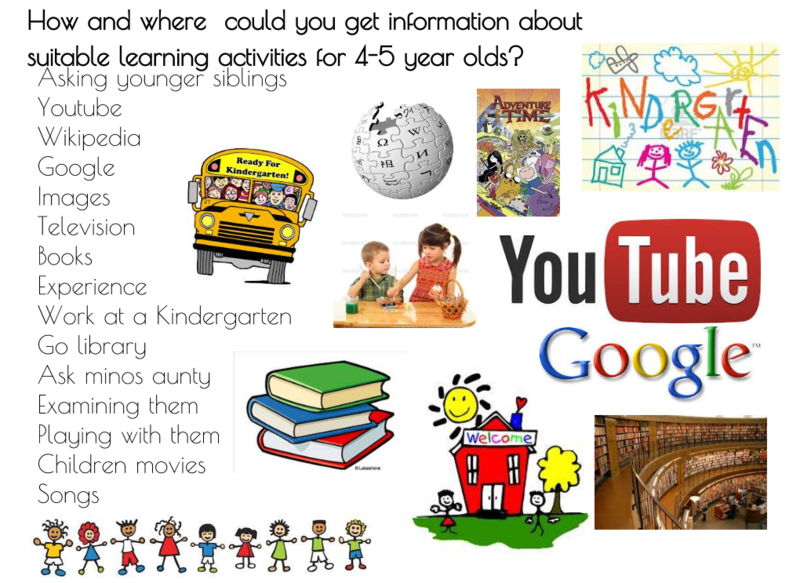 What we did then was get sorted out on Google Plus. 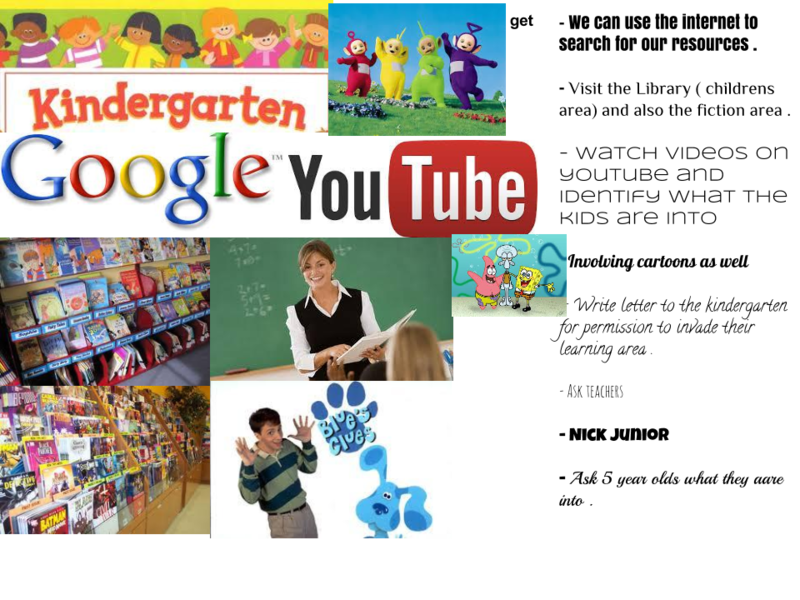 My reason for using Google plus this year is mainly to support the students with the notes and analysis and the higher thinking skills that they need to access the higher levels of achievement. I think my students have had a bit of a shock at the pace of the last couple of days.